In oral arguments at the 4th U.S. Circuit Court of Appeals, a coalition of Virginia and West Virginia residents made their case for grappling with legal questions about eminent domain, even though federal regulators haven't yet made a final determination on the issue. The high-stakes case involves sweeping claims about the Federal Energy Regulatory Commission's eminent domain process, as well as critical questions about the timing of judicial review for pipeline-related lawsuits. The immediate question before the 4th Circuit: Can the landowners' eminent domain lawsuit move forward in district court right now? If their lawsuit has to wait for further FERC action, will it be too late? Construction on the 303-mile EQT Corp. project, which stretches from West Virginia to Virginia, is already underway. "It would be less meaningful to the landowners, obviously, here if by the time they get their complaints heard, the pipe is already in the ground, a $3.7 billion project," Gentry Locke attorney Justin Lugar told the court last week. "The likelihood, I think we all know, of something like that being ripped out of the ground is pretty slim." The U.S. District Court for the Western District of Virginia in December tossed the landowners' key claims, finding that only an appeals court can field a challenge to a FERC pipeline approval. But the Natural Gas Act stipulates that pipeline certificates cannot be appealed in court until FERC issues a final decision on any rehearing requests. Pipeline construction generally proceeds while such requests are pending, often keeping challengers out of the courtroom until after a pipeline is already in the ground. The landowners say they're entitled to judicial review now, even though their rehearing requests are still pending at FERC, because their lawsuit is not a claim under the Natural Gas Act, but a constitutional challenge: that FERC's practice of granting eminent domain authority to pipeline developers violates property rights protected under the Fifth Amendment (Energywire, Sept. 13, 2017). "You can't let FERC allow construction to proceed while these important questions are out there being resolved," Lugar told the 4th Circuit. Judges on the appeals panel seemed frustrated by the judicial review options available to the landowners if FERC's argument is correct that the challenge can be filed only after the agency acts on rehearing requests. FERC usually issues "tolling orders" to extend its 30-day deadline to act on rehearing requests and often takes many months to issue a final decision. Construction is sometimes nearly completed during that time. Judge Stephanie Thacker, an Obama appointee, asked whether the fact that a delay in FERC action is "guaranteed" sets the case apart from legal precedent that has upheld various judicial review specifications in other contexts. "Here, it appears they are barred as a practical matter from all access to the courts until the damage is done," she said. "Isn't that an important distinction?" Judge Roger Gregory, a Clinton and George W. Bush appointee, continued that thread, asking how a court could grant meaningful relief to landowners who bring a challenge once the pipeline is in the ground. "What would the remedy look like, the prevailing party's remedy look like, after the pipeline is in the ground and proceeding along its route?" he asked. FERC attorney Susanna Chu noted that completed pipelines can be excavated. "Has that ever happened that you excavated a pipeline after meaningful review found that there was an inappropriate grant by FERC?" Gregory replied. "It hasn't, has it?" Chu acknowledged that she wasn't aware of any example of that but maintained that courts can and have remanded pipeline certificates to the agency to conduct additional review. Congress specifically set out this judicial review process in the Natural Gas Act, she said. "They will have access to the court at the conclusion, but in the meantime, they simply can't bypass those procedures and bring a free-standing complaint in district court to try to sidestep the congressional procedures," she told the panel, which also included Judge James Wynn Jr., an Obama appointee. Lugar, the landowners' lawyer, said he was encouraged by the court session. "I think the judges understand and were asking the right questions," he said Friday. "They really homed right in on the key issues." A decision is expected in the coming months. 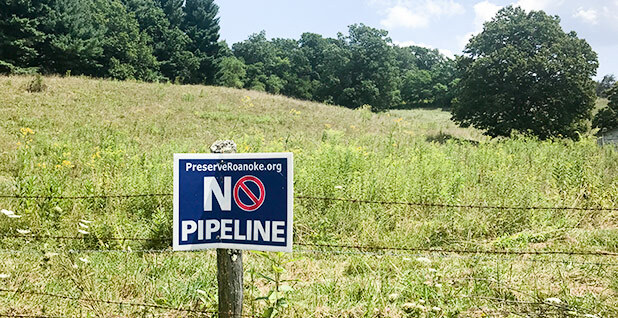 Another set of landowners has made similar arguments against eminent domain for both the Mountain Valley pipeline and the nearby Atlantic Coast pipeline. That case is pending in the U.S. District Court for the District of Columbia; several other lawsuits taking aim at various federal approvals for the projects are also in progress.